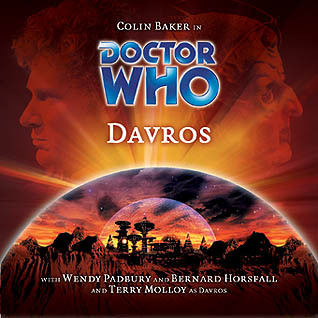 Recently, while listening to an older Big Finish audio, called simply Davros, I said, “Good god, this is spectacular.” Right away, it blasted into the top tier of my Doctor Who/Big Finish list. Terry Molloy, who portrayed the creator of the Daleks in Davros’ last Classic Who appearances, is terrific, and his stabbing banter with Colin Baker’s Doctor is a dream. More important, though, is the story, which explores Davros’ origin and showcases his brilliant, twisted intellect in a way not seen since waaaaaay back in his introduction, Genesis of the Daleks (which cracked the Top 5 list on this very site). Two things came to mind: 1) It’s not a surprise that the story is great, as it was written by Lance Parkin, author of the best of the Missing Adventures novels, Cold Fusion. 2) Why isn’t Davros written like this ALL THE TIME? Let’s face it. Davros is as well known for his hysterical shrieks as he is for creating the Daleks. And considering that he’s also the galaxy’s foremost geneticist with an intellect that rivals the Doctor’s… well, that’s a Dalekanium-encrusted shame. Is it that hard to write a obsessed fascist scientist with visions of galactic conquest? Let’s take a look through his TV appearances. We’ve praised this great tale already on the blog, but let’s call out the chilling performance of Michael Wisher. 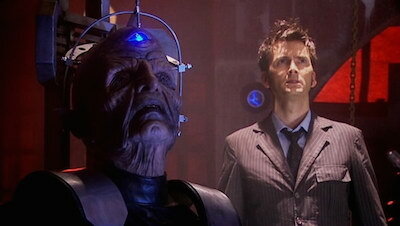 He makes you not merely loathe Davros… he makes you understand him. Davros is a megalomaniacal scientist, sure, but whoop dee doo; Whovian history is full of those. What makes Davros stand out is that he’s also, oddly enough, a patriot. He does what he does because, in his mind, it’s the only way for his nation to “win.” Anyone who stands in his way is a traitor who must be exterminated. Yet, when he seems to secure his victory over the Doctor, he wants to talk to his foe — not as enemies, but “as men of science.” The resulting scene is iconic. Forget the makeup. Marvel at what Wisher does using only one hand and the inflections of his voice. Unfortunately, Wisher wasn’t available for Davros’ return and was replaced by David Gooderson. 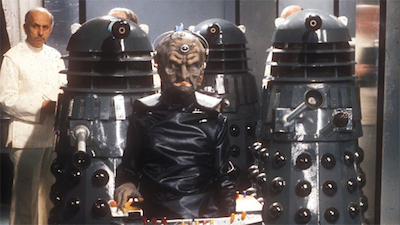 Davros’ makeup, though, was already designed for Wisher. The result, like just about everything else in this episode, is off. The Daleks are mercilessly mocked within the show (blame Douglas Adams’ rewrites more than Terry Nation’s script), they’re treated like unfeeling robots, they’re powerless to defeat the Derek Zoolanders of Space, and both Davros and his creations lack the menace that made the previous story so powerful. Davros, portrayed for the first time by Terry Molloy, gets a little bit of his necrotic mojo back in this relentlessly grim tale (a staple of Eric Saward’s scripts). Not content to be a mere tool of his creations, Davros plots to regain power with help from an extremely handy mind-control needle that’s in his chair. (In fact, it’s SO handy that one can’t help but wonder why he didn’t use it in his previous stories!) But that’s about it for Davros’ character. He does do something that would appear again in the series: He calls out the Doctor on his convenient morality. The Doctor refuses to do the dirty deed of assassinating Davros, although he’d probably find a way to indirectly assign that task to someone else. Davros (Terry Molloy) pops back in the very next season, and this time he has — brace yourself — an actual plan! He pulls a Soylent Green in order to amass funds and create more loyal Daleks to support him, now that the Dalek Civil War is underway. He gets to make a couple of funny business/marketing comments, but otherwise, there isn’t much depth to his character until the climax, where he and the Doctor have it out. Before that, it’s more of the usual “I will make the Daleks the Supreme Power in the Universe” stuff. Without a doubt, one of the best Dalek stories ever. Alas, it’s also the worse use of Davros (a blameless Terry Molloy). He doesn’t pop up until the final minutes, where we discover that he is actually the Emperor Dalek. His ranting is now so over the top that Sylvester McCoy’s Doctor rightfully mocks him. Davros’ final words to the Doctor: a cowardly, pleading “Have pity!” By the roving eye of Rassilon, this is NOT the way the creator of the Daleks should behave! “The man who abhors violence, never carrying a gun, but this is the truth, Doctor: You take ordinary people and you fashion them into weapons… behold your Children of Time, transformed into murderers. I made the Daleks, Doctor — you made this. That description sounds a lot like Peter Capaldi’s Doctor in Series 8, doesn’t it? After hearing Lance Parkin’s Davros, I’m eager to sample to rest of Big Finish’s Davros tales. The guy deserves to be treated well… preferably with a dermatologist on call.